Admittedly, cookie baking is not so high on my get-in-shape-after-the-holidays list at the moment. Maybe not on yours, either. Still, it's Friday. And although I made these before christmas (and gave away a bunch), I still have a few stashed in the freezer. They're really good - chewy and crispy, and chocolatey, and I personally love the hint of mint but if you don't, just skip it. I found the recipe (and adapted it a little) at Baker's Royale. These cookies don't have a lot of fat, but a LOT of sugar. Want more cookies? Check out Sweet as Sugar Cookies Saturday Round-up! Chop the chocolate and melt it - over a waterbath, or in the microwave. In a stand mixer, mix sugar, oil, butter and syrup. Add the eggs, the egg yolk, mint and vanilla. Stir in the chocolate, and finally the flour mixture. Let the dough chill for at least two hours. Roll walnut-sized balls. Roll them in the granulated sugar, and then in the powdered sugar. Place on lined baking sheets - leaving lots of room to spread - and bake at 160°C for about 10 minutes. Let them cool slightly on the baking sheet before attempting to move them. The hint of mint does sound pretty good. Question, after freezing, do you still get the taste of mint? 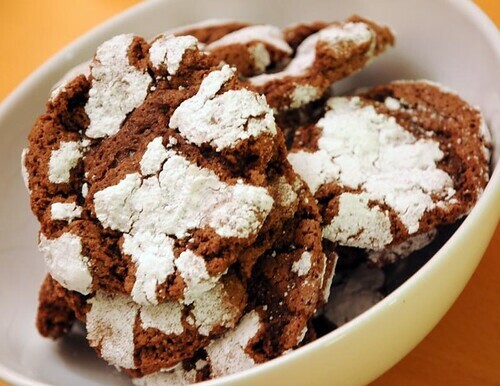 I love chocolate crinkle cookies but that addition of mint sounds like it makes them even better. I'm starting a new linky on my blog called "Sweets for a Saturday" and I'd like to invite you to stop by and link these up. Kenon - absolutely! They're still very minty. Lisa - thanks, I'll check it out. Thanks so much for linking this up with Sweets for a Saturday. I truly appreciate your support. I hope you'll be able to join me again next Saturday. By then, I'll have a cute button that you can grab and add to your post.